When trying to understand the origins of life on Earth, researchers run into a paradox: while water is an indispensable solvent for all known life forms that exist today, water also inhibits the formation of string-like chains of nucleic acid polymers such as RNA that were likely precursors of life. This raises the question: how could the nucleic acids have formed in the first place? One solution to this "water paradox" is that life may have originated in something other than water, and only later adapted to the presence of water. "We are fascinated by the possibility that water-based life may have originated without water at all," Zachary Adam, a researcher at Harvard University, told Phys.org. Adam and others have been investigating a leading candidate for a water alternative called formamide, a clear liquid that consists of hydrogen, oxygen, carbon, and nitrogen. Not only does formamide favor polymer bond formation more than water does, it also reacts with other molecules to form nucleobases, amino acids, and some of the other basic compounds needed to make nucleic acids. But there is a glaring problem with this proposal: formamide does not occur naturally in any significant quantity anywhere on Earth. Although formamide is widely used in industry as a solvent for making pharmaceuticals and pesticides, all of this formamide is synthetically produced. Formamide does exist in space, however, which has previously motivated researchers to suggest that it may have been transported to Earth via comets or meteors. But it is unlikely that this scenario could have produced the large, concentrated reservoirs of formamide needed for life's precursors to form. Now in a new paper published in Scientific Reports, a team of researchers, led by Adam and coauthor Masashi Aono at Keio University and Tokyo Institute of Technology, have demonstrated the possibility that formamide may have been produced in abundance by radiation in some pockets of the early Earth. In experiments, the researchers irradiated hydrogen cyanide and acetonitrile—two chemicals present on early Earth—with gamma rays. They found that formamide was one of the major products. 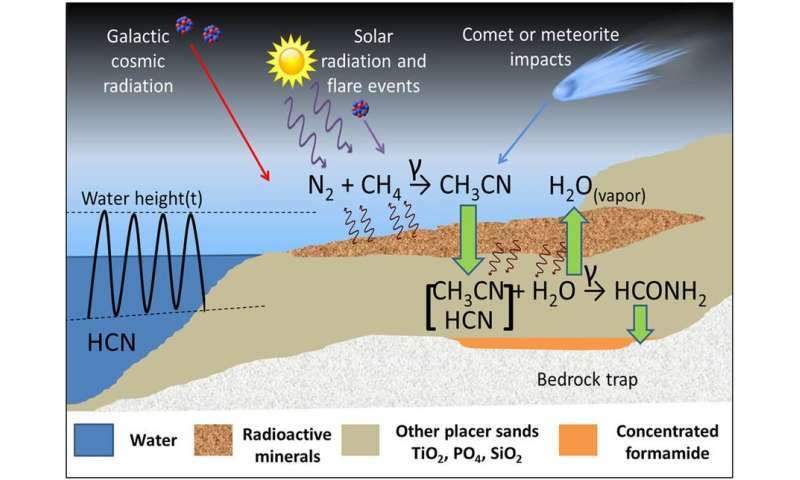 Although in their experiments the researchers used a cylinder of cobalt-60 to produce the gamma rays, they suggest that on early Earth the radiation may have come from radioactive mineral deposits (found today on beaches worldwide) or uranium fission zones. Only one region is currently known to contain evidence of a small handful of uranium zones that existed in Earth's geologic history—the Oklo region in Gabon, Africa—but these zones only became active long after life originated. The researchers calculated that, if similar zones existed 4 billion years ago, a single site could have produced over 6 orders of magnitude more formamide over a given area than that estimated by delivery from comets and meteorites. The results suggest that radioactive mineral deposits can produce enough formamide to accumulate to high concentrations, which could have formed large formamide reservoirs in which nucleic acids could have formed as precursors to the first living organisms. "Often the problem of the origins of life is considered to be solved if we could understand how prototypical building blocks of life such as biopolymers and metabolites could form in plausible early-Earth environments," Aono said. "But we are not satisfied with this way of thinking. Life should not be treated as a bag full of the building blocks, but should be understood as a complex network of chemical reactions." As the researchers explain, radiation is particularly unique as an energy source for the origins of life compared to redox chemistry or simple heating. As Adam said, this is because radiation "drives an expansive network of reactions, not just an array of products for an array of inputs." Of course, the researchers have only showed what could have happened, and not what did happen. In the future, they plan to continue studying all of the possible scenarios for the origins of life and examine the plausibility of each occurring, and see where the evidence leads. "We are now trying to assess whether the full network of the driven reactions exhibits attributes found across many different scales of complex living systems, such as cellular metabolic networks, population dynamics, and even ecological relationships," Aono said. Related video: Zachary Adam's lecture on "Energy, Entropy, and Complexity on the Prebiotic Earth"
this seems like what happened in teenage mutant ninja turtles. Life depends on codes and coded information, and codes and codes and information create meaning, life, and meaningful life. Codes and coded information have an intelligent source. Wow. Circular logic, word jumbles and non sequitur in one sentence. Hmmm I wonder what meaningless life looks like? Anything like useless life? If you believe life "arose" with or without water, you suffer from magical thinking. Might as well go check your yard after a heavy rain for unicorns sprouting all over. There is no "spontaneous life formation". It was decisively dispelled during the 19th century by the experiments of Louis Pasteur. You got some catching up to do. Typical non-scientific article. Just wild speculation. If it were scientific, you could conduct an experiment reproducing the proposed result. If you do the math, even if the universe were 1 trillion times and 1 trillion times older and every star had 10 life friendly planets where every ocean were composed of formamide and every molecule in those oceans participated in stacking a small protein stack of 20 amino acids, an new one every second, the chances of one forming by chance is 1 in 10^130. And the misfire 100 molecule stacks would fill a cube 10^20 light years on a side. Do the math. I hear folks say, "it didn't happen all at once it took millions of years". My calculation give them the benefit of the doubt that the molecules were trying at a frantic pace. If you string it out, the time would be unimaginable. And that is only one small protein. You need thousands to assemble a living cell. Then people say, "these molecules quickly developed intelligence." amazing. even if the universe were 1 trillion times and 1 trillion times older and every star had 10 life friendly planets where every ocean were composed of formamide and every molecule in those oceans participated in stacking a small protein stack of 20 amino acids, an new one every second, the chances of one forming by chance is 1 in 10^130. For somoen who claims the article is unscientific that is the most unscientific jumble of made up junk I've seen yet. Typical non-scientific article. Just wild speculation. If it were scientific, you could conduct an experiment reproducing the proposed result. And lo and behold. If you read the article you would have noticed that they reproduced the proposed result in an experiment. You probably also didn't read the part where they expressly didn't claim that this is how life started but simply that this is a possibility? Reading. You should give it a try. Especially before posting. Helps you seem less dumb. "Nature had definitely more time for experimentation than Louis Pasteur." Where does the idea that "time solves the impossible" come from? There's no basis for that. If life "emerged" wouldn't you also expect other things to emerge? Like phones, airplanes, alternatives to eukariotes, human-intelligence in cats and dogs, etc? Well, they don't. Not now and not in a trillion years. Nothing ever demonstrably "emerged". And most certainly nothing old Darwin fantasized about. Then what is your belief based on? Not the scientific method for sure. Funny you should use those as examples. They DID "emerge" - as a result of many (and I mean MANY!) systems working together. human-intelligence in cats and dogs, etc? Well, they don't. Not now and not in a trillion years. Phones and airplanes "emerged"?!? We even know the names of their intelligent creators. What "systems working together"? Even Google knows enough to make that grammar correction. Are you less intelligent than that simple tool? Now THAT would be fun:-) Their heads might look a little funny, tho.. If no human-intelligence in cats and dogs, then you agree human uniqueness is inexplicable on the account of "evolution", right? Imagination is not science. But might explain your animism. You are so incorrect I wouldn't even know where to start if I had to explain things to you. Just your first few questions are so wrong, they are unanswerable without a lengthy explanation. Since, of course, you would not ask such nonsense if you had even a basic understanding of the subject, any explanation would have to start at a very basic level. So tell me, where did your problems start, why do you reject reality and science? 1. "Natura non facit saltum" (gradualism) is illogical and contrary to everything we know about the absolute discreteness of organisms. This site limits comment size and links. The rest, up to 11. so far, you can find on the blog under evolution where you can reply freely. Whereas the opposite are? The above are simply a prosaic form of Occams razor. Anything else we can help you with? Or are you through with hoisting the "I am stupid' neon-sign over your head for the day? Anyone can be dismissive without valid arguments. Instead you should go check out my arguments on the blog and respond with intelligent counterarguments if you have any. Unfortunately I cannot educate you here due to site restrictions. Much as formamide chemistry is interesting, a problem with the hypothesis is that life likely emerged before there was little if any land. Nature had definitely more time for experimentation than Louis Pasteur. But it requires to start with system, which is able of very gradualist transition from unliving to living state, i.e. the physical state, which is already able to behave like living system in most aspects. This requirement eliminates many possible scenarios of spontaneous life formation, like the formation of life within hydrothermal vents or clays. Pasteur showed that life did not emerge at the generation time of modern life. However, life is a product of geology and geological times scales are much larger. Specifically hydrothermal vents has been identified as the emergence locale by evolutionary methods (Tree Of Life). Life depends on codes and coded information, and codes and codes and information create meaning, life, and meaningful life. Non-scientific and physical ideas are doubly meaningless within biology. If life "emerged" wouldn't you also expect other things to emerge? All the things you described emerges, but in other circumstances. We are discussing emergence of life, not technology; different environments, different selection processes. Exactly that, Darwin is a famous scientist and famous because he was mostly right. Your list is completely Gish gallop response baiting wrong in that light, so does not merit specific response except the link here; try google before illiterate comments: https://en.wikipe...s_Darwin . Individual species trait *are* unique, species defining. A natural consequence of biology; try thinking before illogical comment. Specifically hydrothermal vents has been identified as the emergence locale by evolutionary methods (Tree Of Life). All the things you described emerges, but in other circumstances. You can make statements all day long, but without logical support, your arguments fail. Some random link on wikipedia is not logical support. Is this nonlin org actually the Life based logic guy...?